As stated in the AHSA Rules (1992-1993), “Leg yielding is the most basic of all the lateral movements and should be included in the training of the horse before he is ready for collected work.” It supples the horse, making him loose and unconstrained, and it teaches him to obey the sideways (and forward) driving aids. It is also an excellent means of teaching the novice rider to coordinate his aids. When leg yielding, the horse is straight from to tail, with a slight flexion or positioning at the poll (just enough for the rider to observe the inner eyebrow and nostril) away from the direction in which he is moving. The horse moves forward and sideways on two tracks. The inside legs pass and cross in front of the outside legs. Leg yielding, though in competition usually shown on the diagonal in the trot, may be performed at the walk or the trot – for a short distance – on the long sides of the school, on the diagonal, or on the circle. The rider should sit centered on the horse with his inside leg near the girth and the outside leg behind. The movement is initiated with the inside seat and leg displacing not just the quarters, but the entire horse at his center of gravity. This leg should be applied at the moment when the inside hind leg is lifting off the ground to start the forward/sideways step. If necessary (usually on greener horses) the aid is repeated with every stride. As the horse reacts, the rider’s weight should move subtly toward the desired direction of movement. With more advanced horses this weight shift is often enough to sustain the movement. The forehand is guided along its intended track by the outside rein. The supporting action of the rider’s outside leg applied in time with the horse’s outside hind leg lifting off prevents the loss of lateral balance and keeps the horse thinking forward into the bit. The momentarily non-allowing outside hand used in close coordination with the outer leg prevents overbending or the horse falling onto his outside shoulder. Collapsing the inner hip or ribcage; Rider left behind the movement. Bracing the outer leg off the horse’s side or too far forward. Drawing the inner leg too far back. Tipping the upper body forward, looking down. Hanging in the inner rein producing a stiff jaw and overbent neck, allowing the horse’s outside shoulder to escape. Loss of rhythm or energy. Overbending at the withers and through the neck, popping the outside shoulder. Insufficient self-carriage, stiffening the jaw against the hand. Improper alignment – exaggerated leading of the haunches or forehand; along the rail the movement performed with too much angle. As much as possible, leg yielding must be done with the horse in both lateral and longitudinal balance. Commonly, novice riders try to sustain the lateral movement for too many strides and the balance is lost. The horse pops his shoulder or leans against a restrictive hand. During the movement, the rider must expect to make frequent rebalancing half halts. In training it is usually better to discontinue the leg yielding after a small number of steps and to reward and re-energize the horse with forward riding on one track. See Figures 1, 2, and 3. The horse proceeds on the diagonal from K towards M. Near the quarterline the horse is re-positioned to the left at the poll. The horse’s center of gravity continues on the diagonal towards M, but a half halt re-balances him, makes his outside shoulder “wait”, and for several steps brings the horse’s body nearly parallel to the long side of the arena. As the horse responds correctly and before energy is lost, the horse is re-straightened onto one track and sent forward to the receiving outside rein on the diagonal. This process is repeated as the horse responds correctly and as space permits. A variation may be performed on a similar line in the rising trot. The horse proceeds across the arena, and after X the rider switches to the new outside posting diagonal. As above, the horse is re-positioned at the poll, rebalanced off his outside shoulder, re-aligned parallel to the centerline, and yielded energetically the last handful of strides to the corner marker. The horse momentarily enters the diagonal on one track as the rider establishes the line. As in Figure 1, he is re-positioned, rebalanced, and yielded diagonally for several strides. But this time before the quality of the movement is impaired, the horse is ridden straight forward parallel to the long side. With energy and connection restored, the process may be repeated, creating a “staircase” pattern. Leg yielding may also be done along the wall, either nose to the wall or tail to the wall. In leg yielding nose to the wall, a format particularly beneficial for novice riders and/or horses, the rider turns at A cutting the first corner. He approaches the wall with a straight horse on an angle of about 35 degrees relative to the wall. The horse is positioned at the poll towards the wall; so in this example the right side is the inside. As soon as the horse’s head reaches the wall, the rider should apply a half halt.The fact that the horse is angled into the wall will help the half halt to have its backward rebalancing effect. For the novice rider this format provides an ideal opportunity to have to make a half halt and to feel its effect. As in Figures 1 and 2, the leg yielding is carried out for a limited distance. Before B the horse is straightened onto one track and freed to walk (or trot) forward into the bit. Then a shallow loop brings the horse back to the wall on the same 35 degree angle to resume the leg yielding to M. In this format the wall itself as well as the rider’s aids redirect the horse laterally, diminishing the rider’s natural tendency to pull on the reins. In all three of the above examples, the rider’s ability to control the horse’s balance is of prime importance. Creating freedom in the shoulders and a moveable forehand enhances the rider’s ability to rebalance the horse to the rear. Throughout, the horse must work actively into a receiving outside hand. The half halts must make a momentary interruption to redirect the energy, but the rider must avoid prohibiting forwardness while trying to make lateral displacement. Riders are also well advised to avoid prolonged repetitions of leg yielding or other lateral exercises without interspersing periods of energetic movement straight forward. Throughout each leg yielding exercise the horse must be kept as actively on the aids as possible. If he tries to lean through the outside shoulder, brief straightening, balancing, and attention-confirming transitions between (or within) gaits may be performed while maintaining the leg yielding alignment. Attention must also be given to maintaining the soft flexibility of the poll. FEI and AHSA competition rules require the horse to be slightly positioned at the poll away from the direction of movement. In training, however, it can be useful on occasion to establish the leg yielding movement and to test the poll’s flexibility with a brief counter-positioning toward the direction of motion. The poll should remain unlocked and pliable. The German manual Principles of Riding shows counter changes of hand in leg yielding. Figure 4 shows a simple preliminary exercise to help novice horses and riders develop the required coordination and balance. Ride a quarterline to quarterline shallow serpentine. After the centerline yield the horse several strides laterally following the serpentine track. At the outermost point bring the horse back on one track and continue onto the next loop, repeating the process after crossing the centerline the next time. Subtle hints of leg yielding and their attendant half halts may be employed to prepare the horse (or to test his readiness) for other movements. The horse starts on the diagonal, is re-positioned, rebalanced, and leg yielded towards X. This activating, gathering effect is transferred into energetic lengthening on the quarterline. The horse turns onto the centerline and proceeds from D towards B in lengthened steps. 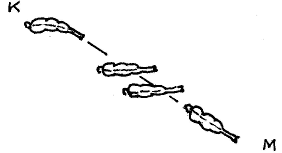 Then using leg yielding nose-to-the-wall (as in Figure 3), the horse is re-gathered in Working Trot, as the yielding activates the right hind leg and the wall minimizes the rider’s temptation to pull. Upward or downward transitions may be ridden on the circle through a shallow leg yielding (forehand in) to encourage the rider to use aids in sequence and with correct timing. This avoids the tendency to block the horse with a bilateral restraint in the hands. Several strides of shallow leg yielding are also a suitable preparation in schooling canter departs. The preparation and execution of good canter departs are, in themselves, good suppling exercises. In this example, they are combined with the suppling effect of the leg yielding from K to X. Maintaining the same left positioning and with the rider’s legs in the same position, the horse must strike off promptly at X and turn immediately onto a ten meter half circle back to the track. Leg yielding may be employed with more advanced horses to freshen them in half pass, to supple them, and to keep them honestly on the aids. This example shows a training exercise that leads into counter changes of hand in half pass. It may be ridden in walk or trot. Begin with half pass to the right. To enhance the crossing of the legs or to further free the shoulders, upon crossing the centerline make a distinct unbending/re-positioning to an active leg yielding, maintaining the direction of motion. Approaching the counter change point, switch to left shoulder in on a line parallel to the centerline. This puts the forehand in advance for the new half pass to the left. This sequence is repeated through each change. Counter leg yielding on the circle can help a horse that does not understand the idea of following the bit towards the ground. Ride in the trot with a very active right leg into a non-allowing right hand. Shift the weight off the horse’s right shoulder and onto his left hind leg. Both reins direct the horse to the left: the right rein with a firm indirect effect, the left rein more softly opening and guiding. The left leg is back but relatively passive as the driving leg and the rider’s weight carry the horse slightly “off balance” to the left. As the horse softens on the right and yields through his body, re-establish the inner bend on the circle with the left seat, leg, and an inviting left rein. The horse should remain on contact but follow a relinquishing right hand as it invites the horse to reach long and low. Turn on the Forehand may be seen as a specialized form of leg yielding. It may be performed at the halt or from the walk, having two prime functions: obedience to the sideways driving aids and suppling. Like leg yielding, it provides the novice rider with a good opportunity to coordinate his own aids and to synchronize them with the horse’s movements. When performed from the halt, as in leg yielding the horse is straight in his body and slightly positioned at the poll to the inside (away from the direction the body is yielded). The horse should be accepting the bit and should move his quarters in even, regular steps around the horse’s inner front leg while maintaining the rhythm of the walk. The inner hind crosses in front of the outside hind leg. 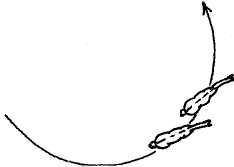 In Figure 11 (Above) the horse makes a left turn on the forehand. The horse is positioned to the inside (left) at the poll. 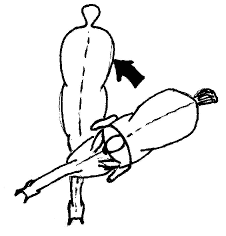 The rider’s left leg is at the girth to activate the horse’s inside hind leg and to move his center of gravity to the right. As the horse responds, the inner leg relaxes as a reward. The rider’s outside leg, in turn, placed behind the girth prohibits the quarters from deviating, regulates their movement, and keeps the horse thinking forward into the outside rein as he yields around the pivot leg. The outer hand reacts to the outer leg in close coordination with a momentary restraint which keeps the horse in balance and prevents him from walking away or from leaning onto his outside shoulder. Same as in leg yielding: collapsing hip; legs in wrong position or off the horse; losing the vertical body alignment; hanging in the reins. As Turn on the Forehand is not a movement currently done in competition, how it is carried out in schooling will depend on the training needs of a particular horse. For some sluggish, inattentive horses, the primary goal is to generate a sideways response to the driving leg. If the horse steps slightly forward or even bends too much in the neck in early attempts, the priority goal may still be satisfied. A more reactive, nervous horse may want to swing too far, falling through the rider’s outside leg. Such a horse should learn to trust being surrounded by the rider’s aids. He may be yielded a step or two and then with the outer aids be asked to pause momentarily, relax, and wait for the next cycle. A horse that wants to rush forward from the leg may need the rebalancing, limiting portion of the aids to be louder. With such a horse, if he happens to step backward while learning not to evade out through the front, no harm is done. Gradually the horse learns to accept a closer coordination of the aids and a tighter definition of his responses. Performing the movement in the walk makes it even more reminiscent of a leg yielding done on a small circle with the horse’s body pointed at (or nearly at) the center of the circle. Easing the process of mobilizing the forehand and freeing the shoulders. Simplifies keeping the horse in front of the leg and honestly connected over the topline into the hand. Omitting discontinuities and developing the interplay among the aids permits the rider to test the unilateral softening on the inside while keeping the horse round and reaching through his outside frame into the bit. As in leg yielding, the exercise also provides the opportunity to test and teach the rebalancing effect of the half halt on the outside. The size of the circle described by the track of the inside front hoof may be varied according to the rider’s needs and the horse’s stage of training. A maximum of several meters on an inexperienced horse may be reduced to nearly-on-the-spot on a trained horse. Turning around the forehand in the walk may be combined with other suppling exercises, eg: other lateral movements or transitions. Diagonal leg yielding towards the quarterline, maintaining straightness and poll positioning, evolves into turn on the forehand in the walk moving away from the same leg. After 180 degrees of rotation, return to the track on the reciprocal of the original line, continuing the leg yield. The horse is proceeding in walk on the circle, bent conventionally to the inside. The horse is counter-positioned and yielded one or two steps towards the center of the circle. The rider continues the motion, executing a turn on the forehand in the walk to the right. The horse’s quarters move clockwise through 180 degrees. The rider executes a canter depart from the walk or a transition to trot directly out of the turn to check if the horse is on the aids and able to step under himself and through to the hand.